Fannie and Freddie are moving on. The two government owned mortgage lenders are planning to raise loan guarantee fees for 2014 in an effort to scale back their presence in the mortgage market. It’s a move that has considerable implications for the mortgage industry – and an unexpected upside for investors. According to a new report by Bloomberg Business, the Federal Housing Finance Agency (FHFA), which oversees both Fannie Mae and Freddie Mac, announced the fee hikes effective in the spring of 2014, and they’ll also include higher interest rates for borrowers with poorer credit. Fannie Mae, officially known as the Federal National Mortgage Association, and Freddie Mac (the Federal Home Loan Mortgage Corporation) are slowly recovering from a checkered past that has its roots in the massive housing meltdown of a few years ago, when millions of home loans went bad and mortgage lenders were held accountable for much of the mess. The two agencies went into conservatorship in the fall of 2008 after backing so many risky loans that they ended up facing collapse. The government stepped in to bail them casino spiele out, offering billions in aid to keep the mortgage pipeline flowing. Now, government backed mortgage lenders, which include not just Fannie and Freddie but also the Federal Housing Administration and a few other agencies, dominate the mortgage market, originating the bulk of home loans serviced by lenders around the country. After all this, as the housing market continues its recovery, it seems that Fannie and Freddie are now turning a profit for the first time since going under conservatorship. And in a changed mortgage market dominated by new regulations aimed at protecting consumers and tougher controls on lenders, these two agencies are taking steps to reduce their presence in the market. The move comes as new housing bills aimed at reducing the government’s involvement in housing continue to work their way through Washington. 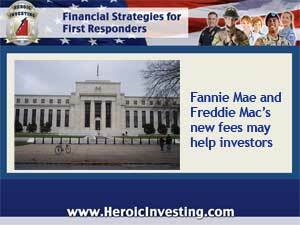 But the strategy adopted by Fannie and Freddie takes a different tack – raising the fees charged to lenders to guarantee their loans. Although the fee hikes are aimed at lenders, not consumers applying for loans, they’ll be passed on to borrowers in the form of higher interest rates. And that, combined with the higher interest rates the FHFA expects to impose on riskier borrowers, could chill a mortgage market that’s already facing a slowdown in mortgages issued, thanks to tighter lending standards imposed by the Qualified Mortgage Rule and other legislation. Learn investing secrets from the pros at Jason Hartman”s Meet the Masters of Investing Event in Irvine, CA January 18-19, 2014. Find out more here.